Below the neoclassical architecture of Moscow’s Manège - which this season basked in an unexpected spell of bright spring sunshine - the Autumn-Winter 19 shows for Mercedes-Benz Fashion Week Russia, the largest fashion event in Russia and Eastern Europe, kicked off before the eyes of international press, buyers, PRs and street-stylers. From the line-up of designers to the featured spaces, change was in the air this season. 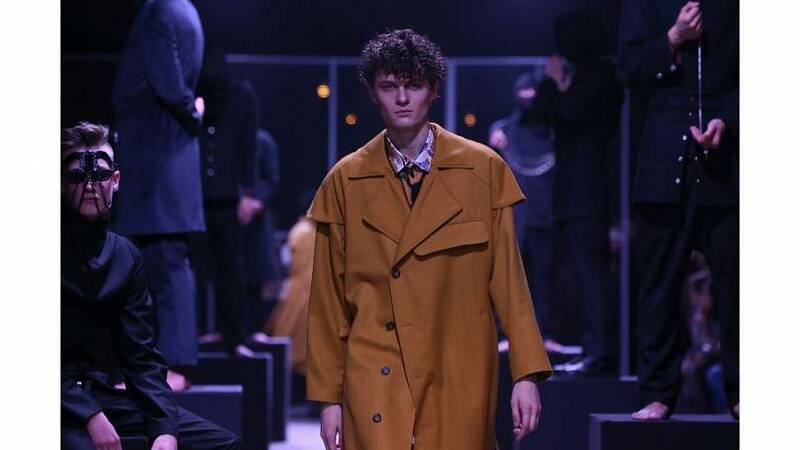 Show-goers were able to view the collections not only in the imposing space of the Manège and the Museum of Moscow, but also in TSUM - Russia’s most opulent department store - and the Museum of Fashion. For the first time, a Global Talent Initiative saw nine emerging creators debut their collections alongside native designers, from Italian labels VANTA and JING YU to Bangladeshi talent RAP, and there were new initiatives in place for model casting too, with The Russian Fashion Council ensuring that at least one ‘model of elegant age’ (over 55, to be exact) walked in shows by eight fashion houses. 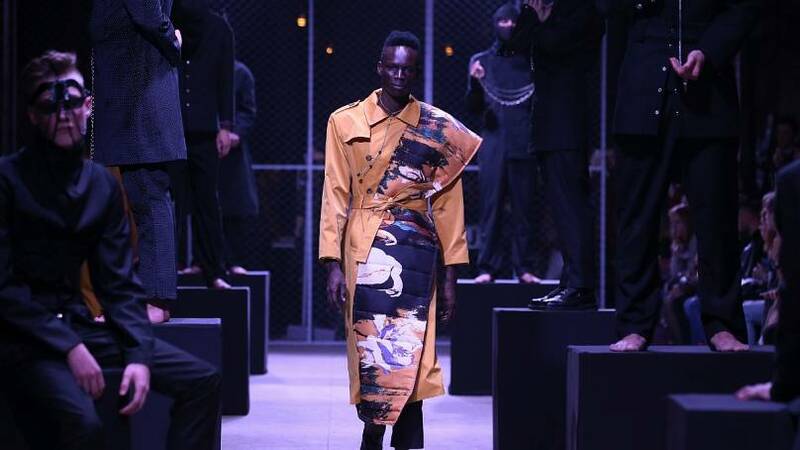 There was no hiding the fact that people of colour were underrepresented on the runway, with only a handful of BAME models taking to the catwalk. It was, however, heartening to see Russian transgender model Nika Kraush walk for an assortment of designers. 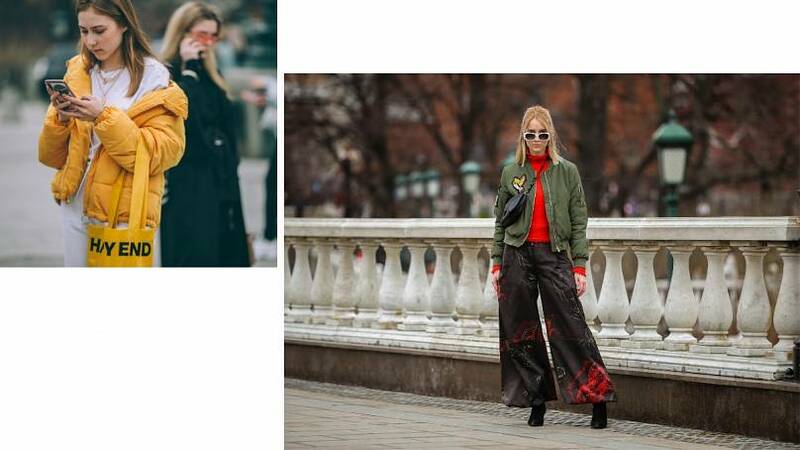 Russia’s conscious fashion scene is in its fledgling stages. Fur and exotic skins remain prevalent, with eco-centric design served as a side note, leaving room for young trailblazers like master of utilitarianism Ksenia Gerts - who debuted this season - to pioneer new practices and make their mark. There was much to be celebrated, though, in terms of enduring wardrobe staples, natural materials and craft-inspired looks that reimagined heritage styles and fabrications with panache. 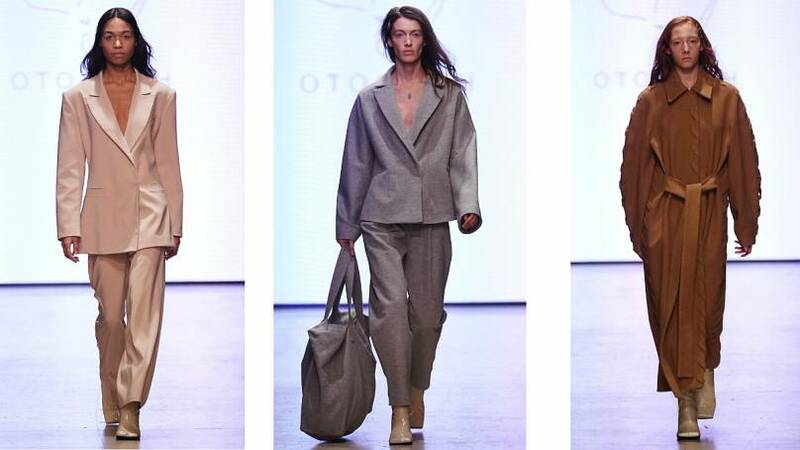 Read on for Living it’s pick of Russia Fashion Week’s futureproof labels. 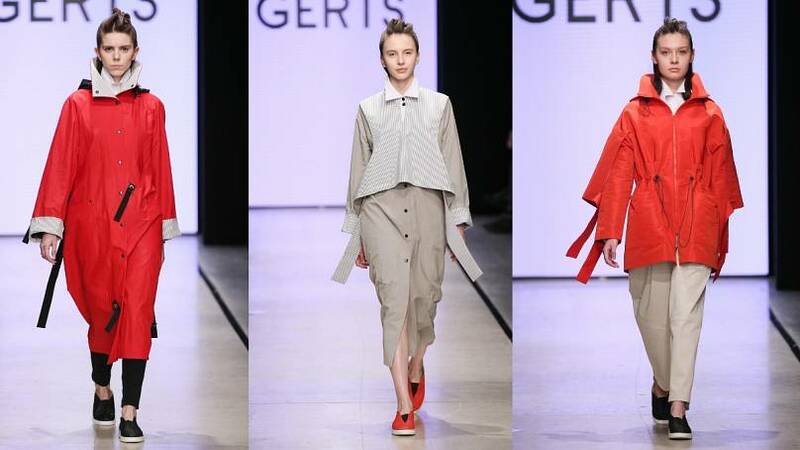 St Petersberg-based designer Ksenia Gerts is fast becoming a pioneer in Russia’s emerging conscious fashion arena. Known for utilitarian styles elevated with contrasting textures, the young designer brought a new technical dimension to her AW19 collection with the use of Verisium chip technology, along with simple almond-toed sneakers in red and black, crafted from pineapple leaf fibre Pinatex. 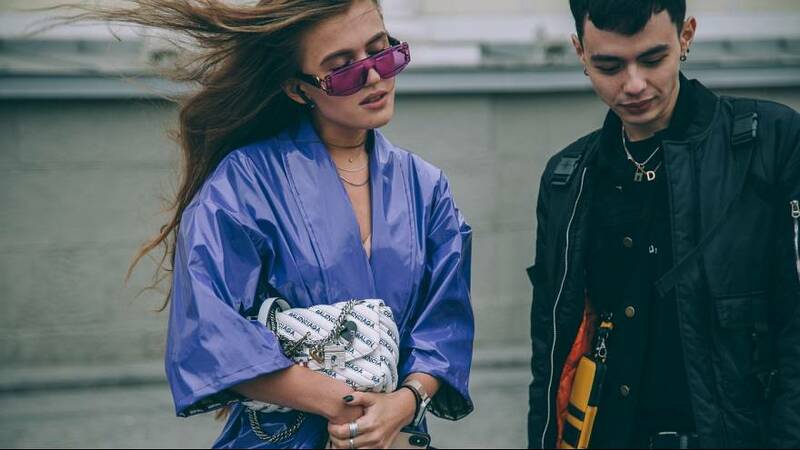 Much like the blockchain tech used by brands such as Louis Vuitton, the Verisium chips, enclosed in each piece of clothing, stream information on the item and its creators to the owner’s smartphone or portable device, putting Gerts at the forefront of fashion technology. Downstairs in the designer showrooms, guests were able to view the new collection using augmented reality devices provided by The 3D Cap Company. 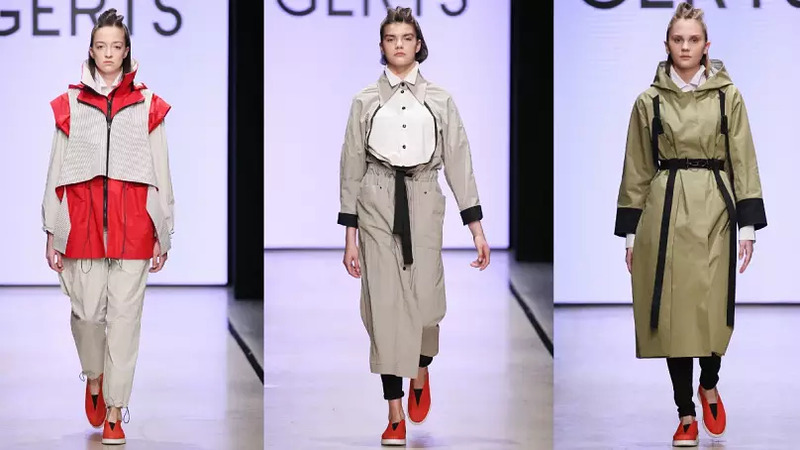 For AW19, Gerts showcased longline, tech-fabric coats in khaki, grey and letterbox red with contrasting cuffs, panels and zips, layered over simple cropped trousers in cream and camel. All cotton and wool items were waterproof thanks to a coating of environmentally-friendly fluid Hydrop, and parachute styling details were everywhere, from drawstring ruching to dangling straps and supersize pockets. Expect to see much more of Gerts as she continues to carve out her niche. 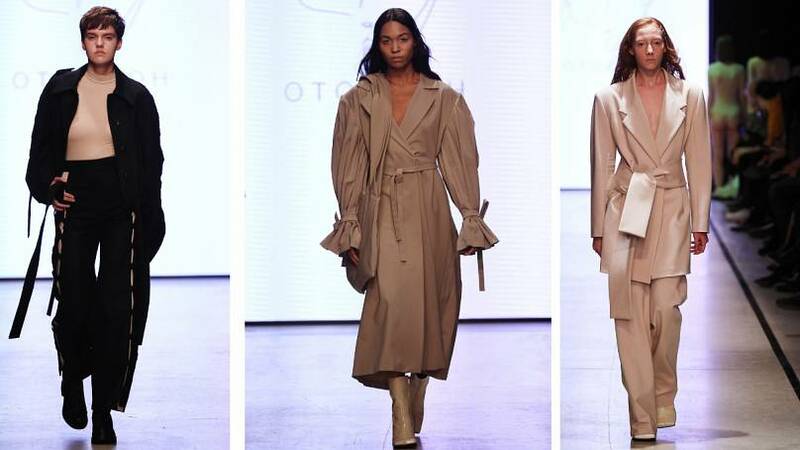 With high-octane glamour to the left, and youthful street style-oriented labels to the right, Russian label Otocyon’s founder Lesya Ruakovich offers a point of difference with her architecture-inspired womenswear, finding a middle ground not yet plundered by her native designer peers. Dealing in minimalist-leaning cuts, abstract shapes and palette-cleansing neutrals, the brand’s “women for women” ethos shines through all aspects of its aesthetic, which is at once feminine, restrained and deeply modern. For AW19, Ruakovich reiterated her preference for elevating pared-back separates and clean tailoring with playful details, such as overlong sleeves or wide, elaborately knotted belts. There was louche, powder-blue suiting, sand-toned utilitarian jumpsuits, and luxurious wool coats with plaited details and bolstered 80s shoulders. With its long, cold winters (previous seasons have played out in -12°C temperatures) you can rely on Moscow for premium wool-wear. Contemporary knitwear designer Ksenia Seraya, who cut her teeth in the Ermanno Scervino knitwear department and is based in Russia’s capital, strives to balance the inspiration she draws from time-honoured craft methods such as crochet-hook knitting, with the technology offered by digitalised knitting programmes. 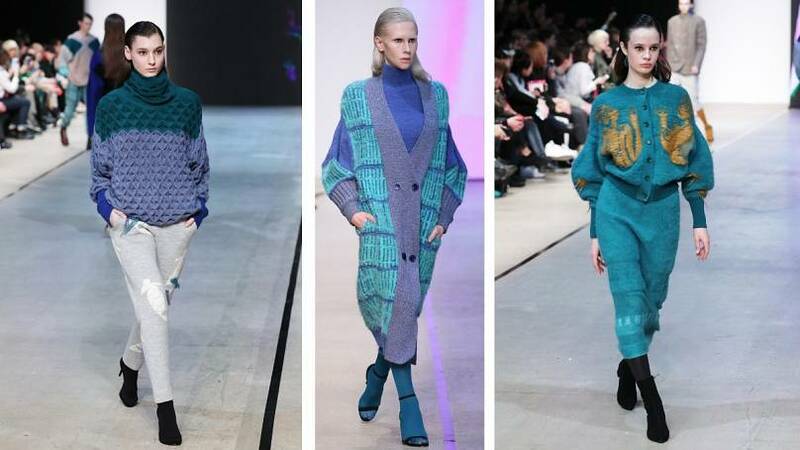 Seraya’s ‘demi-season woollen fantasy’ for Autumn-Winter 19 was inspired by the Russian countryside life and delivered in cerulean colourways. There were ice-blue twinsets (bishop-sleeved, gold-embellished sweaters up top, figure-hugging midis below) bold jacquard fabrics, and calf-grazing checked cardigan dresses worn over block-colour roll-necks. Some fabrics were recycled from old Soviet sweaters from the 1980s and emblazoned with prints by Roman Manikhin, while others were adorned with retro prints inspired by the works of Jean-Michel Basquiat, designed by Moscow-based label MAD DAISY. Old and new, Soviet and European, all in one winter-proof package. 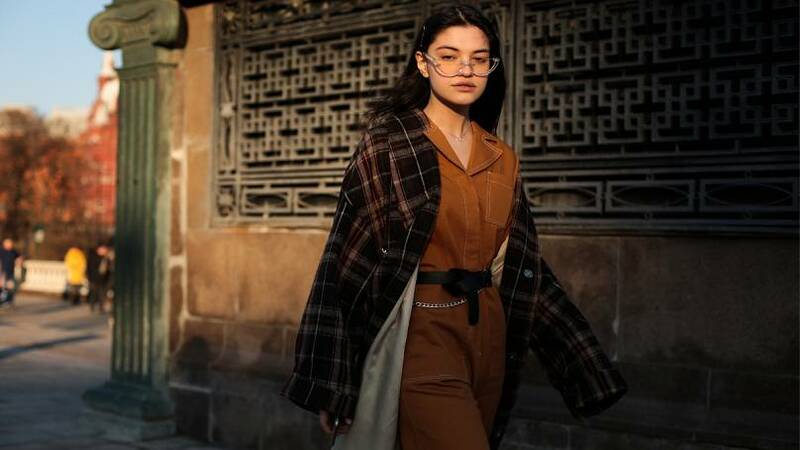 As part of MFWR’s new global talent initiative, Italian label Jing Yu showcased a collection of craft-inspired modest fashion, rendered in a colour palette of black, oatmeal, paintbox-red and smoke-blue. The young independent project, established in 2017, has a philosophical tone beyond its years, playing with ideas of identity, self-restraint, and the conflict that arises between traditional values and the pressures of trend-driven fast fashion. 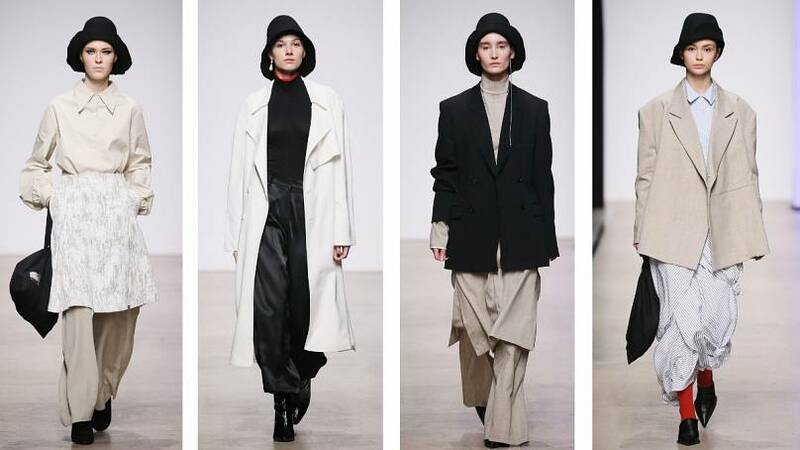 For AW19, layering was key, with pleated cream skirts worn over loose beige tailoring, bright white duster coats offset by jet-black roll necks and a-symmetrical shift dresses worn over wide-leg trousers. Necklines were high – shirt collars or turtlenecks only – and tie-side details were everywhere (on trousers, sleeves, and cuffs) adding an extra degree of cocoonage yet simultaneously hinting at the item’s removal. Crisp textures, such as the starchy sand-toned shirting with exaggerated collars, provided a contrast to the flowing multi-layered skirts, while the folk-style hats that crowned each look added to the heritage flavour. Contemporary menswear designer Luiza Alkhanashvili, who trained at Volgograd Technological College and started out working in a knitting factory, seeks to put a modern, streetwear-inspired spin on classic wardrobe staples. For Autumn-Winter 19, the designer cemented her interest in themes of self-expression and individualism with a collection that paid homage to post-punk and synth-pop. Brutalist influences were woven throughout, with models stomping the runway in reworked military staples, from deconstructed boxy wool coats to boy scout shorts and army trousers. A colour palette of deep blues and muted greys was broken with brilliant white, tan, orange and bright splashes of animal print. A collection to wear while listening to Kraftwerk at full volume.